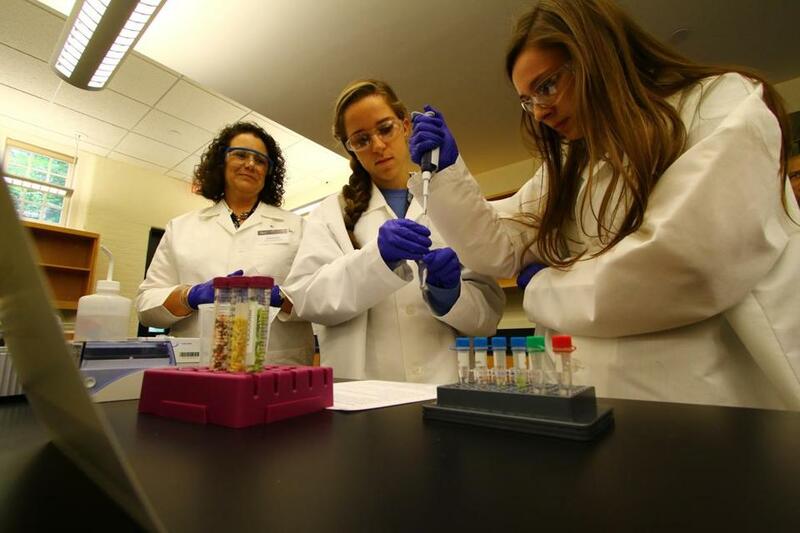 Dr. Nicole Nichols of New England BioLabs watched Archbishop Williams students Jaclyn Shuttleworth and Sarah Golden. IPSWICH — When Jon Hamilton, 17, was asked an impromptu question about recombinant enzymes during a tour of New England BioLabs Inc. on Thursday, he uttered a few words about DNA before trailing off. He glanced, hopefully, at his high school lab partners, Sarah Golden, 17, and Jaclyn Shuttleworth, 16, whose eyes widened at the appeal. The students have been relying on one another in classrooms since their freshman year at Archbishop Williams High School in Braintree. That also happened a day earlier, when Hamilton was thrown a curveball question from a panel of judges at a national science competition. The team was one of five finalists — out of more than 300 teams — in the first Genes in Space competition, which asked students from grades 7 through 12 to use DNA analysis to solve a space exploration problem. The juniors from the Braintree school chose to study the shielding abilities of NASA’s International Space Station, to determine the safest part of the station for astronauts. Radiation in space, which can ultimately lead to DNA mutations and cancer, is the biggest risk for travel to Mars, according to Julie Robinson, chief scientist for the International Space Station Program. It’s the scope of the problem and the breadth of the solutions that the organizers say is the essence of the competition. The goal, according to Zeke Saavedra, cofounder of miniPCR, one of the groups behind the competition, was to excite students about science and show them the potential of their own ideas. “They can understand that feeling, that anything’s possible,” Saavedra said. The five final teams worked with mentors from Harvard University and the Massachusetts Institute of Technology to refine their experiments and perfect their presentations. The winner, Anna-Sophia Boguraev from Bedford, N.Y., will have her experiment, which tests radiation’s effect on the immune system, performed 250 miles above Earth on the International Space Station. Genes in Space was announced this year by Saavedra and cofounder Sebastian Kraves at the National Science Teachers Association conference in Chicago. The competition was a collaboration between Boeing Co. and the Center for the Advancement of Science in Space, and Math for America, which helped target teachers across the nation. The groups cold-called science teachers across the nation and reached out on social media to spread word of the competition. Kraves said the effort led to submissions from 25 states. It is the unknown of the cosmos and the excitement of space exploration that sparks students’ interest in science, the organizers said. And it is competitions like this, with classroom ideas translated to the real world — or 250 miles above it — that begin to make learning tangible, said Ken Shields, director of operations and education initiatives at the Center for the Advancement of Science in Space , a nonprofit involved with the International Space Station. In the future, David Copeland, manager for research integration at Boeing, said the goal is to expand the competition, launching it twice a year. “Our idea coming here is not to pick a winner, but to engage as many students as possible,” Saavedra said. Veteran researchers volunteered to judge the designs. The three students from Braintree said that even though they didn’t win the contest, the opportunity to collaborate and to develop a simple answer to a complex problem burnished their desire to help people. All three want to become doctors. Correction: An earlier version of a photo caption in this story had the incorrect name for New England BioLabs.